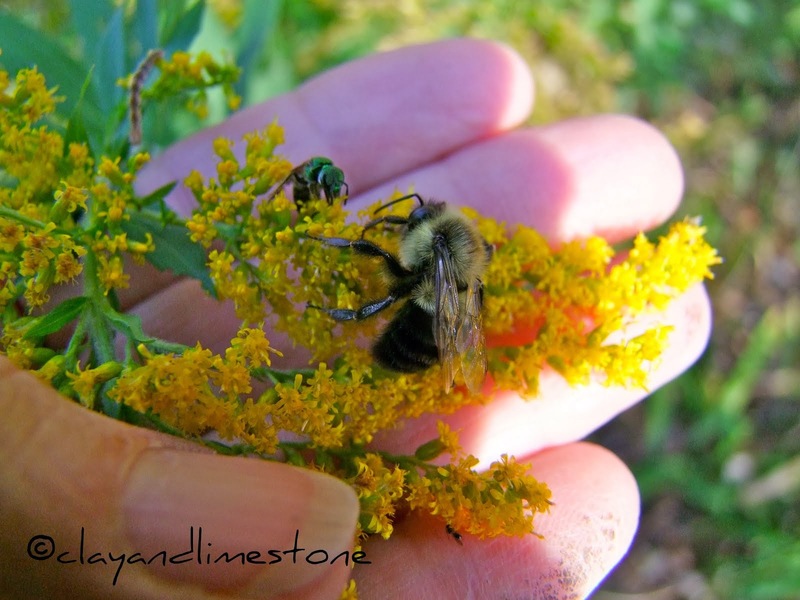 clay and limestone: It's Always The Time To Think About Pollinators! It's Always The Time To Think About Pollinators! Even with the oppressive heat and humidity we're experiencing in the Middle South, it's not too late to add a few annuals to the porch or patio. The sun loving bees, butterflies and other pollinators will appreciate the pollen and nectar. somethings noshing on my Susans! They round out the native plantings and add a spot of color to The Susans in my garden. As you're wandering the nursery and checking out the sales~ go ahead~take a chance on the fading Verbena bonariensis...You can dead head it for more bloom or let it go to seed. Sure the lantana isn't looking so hot; but, trust me, it will perk up with care and will continue to bloom until frost. 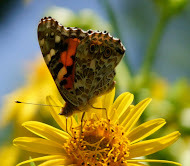 The last butterflies will thank you by stopping by for a bit of nectar. While your looking around grab that red penta that looks like it's fading~Don't be fooled. You can cut back the seed head and have a new flush of bloom that will draw the local hummers to your garden. They visit mine everyday~ Someday, I hope to actually photograph them. You don't have to restrict your late summer sales purchases to annuals! Perennials are on sale, too. In bloom! Look for perennials that make sense in your garden; that provide pollen/nectar; or, are host plants for pollinators. I bought three more Rudbeckia hirta 'Cherry Brandy' at a big box store yesterday. I don't care if they don't make it through the winter or that they're seedlings might not breed true. 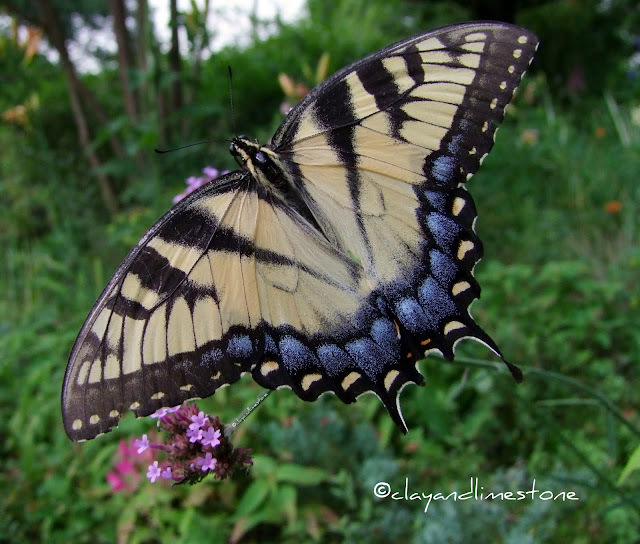 What's more important to me is how very popular they are with the littlest pollinators and garden visitors right now. Plus, they look spectacular massed by the front door. I just planted them in a container and keep them watered. Easy peasy! So go shopping for plants! Take your time, look around, see what's available. You'll be surprised at the quality of many of the sale plants. They aren't all root bound or dried up. With a little tlc the annuals will rebloom and the perennials will be ready for fall planting. Just remember, it's always time to think about pollinators. plan for bloom from late spring to early winter. Now, please raise your mouse and solemnly swear that you will never, ever, ever, ever, ever use pesticides in your garden. Now don't you feel better for having made that commitment! Mouse raised! I would add that while you are out plant shopping fro annuals and perennials, check out shrubs for fall planting. Buy them on sale and keep them watered then plant when it finally cools down. Ask the garden center staff if they'll be getting more shrubs in for fall planting. It really IS the best time to plant them, at least in zone 5b. Mouse raised here, as well! What an instructive post, dear Gail. The pollinators AND the local nursery owners will be happy and so will the gardeners, to have some fresh color in a fading summer space. Where is that credit card? Gail, I watched a hummer for the longest time yesterday. She was in love with an apricot, tropical hibiscus and yellow mandevilla. I bought both of those on sale when the weather started heating up. I'm so glad I did. Finally getting back to reading 'Botany of Desire' and the information he shares about the different type of blooms and who they attract. I need to reread it and make some better observations in my garden. I sure have enough pollinators to make a good study! Gail, such glorious photos today. So sorry to hear about the heat - it made the paper in Toronto today! So oppressive. You wouldn't know it to look at your garden photos. The colours are magnificent. Gratefully here there is a pesticide ban - so even those who are tempted, can't. The pollinators are fixated on all the susans and especially the lemon thyme. Have to be so careful with my weeding so as not to disturb them. Oh I am always up for some plant shopping! Very good idea. I am finally seeing more butterflies in my garden. I was worried because I wasn't seeing any of the tigers and monarchs like I normally do. But they are here now and I am one happy gardener! I think I might just be ready to go plant shopping again. Thanks for the reminder. I never tire of looking at ( and taking) photographs of bees and butterflies. Yours are exquisite. There's a need to get the "no pesticides" to farmers as well as gardeners. The most popular stops on the pollinator tour of my garden are Black and Blue Salvia and Miss Huff Lantana. Actually going to Lowe's today! That bumble bee in the first photo is quite the acrobat. Your photos are more beautiful each time I look. Great information about planting too. Have a great weekend. Beautiful blooms, great advice & love those little friends. Sure wish there was more places close by. Haha, been doing some fall plant shopping. Like we need reminders. ;) :) Plant shopping is the only kind of shopping I like! It is gratifying to see lots of pollinators in the garden. The shot of the butterfly on the Rudbeckia is gorgeous. I have more blooming than it seems when I look out the window! The butterflies really showed up this week. We got rain today! Hooray! More blooms! Gail, you are such a great pollinators' advocate! And your photographs are amazing!!! I am about to post about bumblebees on my escallonia. Indeed some things do bear repeating every now and then - I'm leaving the ugly madia sativa for a while, which is a native weed here, that the bees etc enjoy. Gail, all of the garden centers, and employees will thank you enormously for writing this post. August is one of the hardest months to work there, it's hot, HOT, and there are so few customers that it's tedious. I got some great bargains lately, and I love it. Actually I think of it as saving a plant's life. Your photos are simply amazing. No clue what mouse raised means, but I appreciate this post. Never though tot buy end-of-season annuals to help our friends in the garden. By the way, your spelling and grammar are so spot on, you should let your spell check know to use you're vs. your. Good post, great photos. Thanks for sharing! Lovely post, full of good ideas to sustain those much needed pollinators. It is hard to go shopping for my tiny garden, but I am always on the lookout for plants to attracts pollinators. In my garden the Monarda and Caryopteris are most popular along with the Duranta. Oddly, the phlox and Susan's are not attracting, and I have large drifts of both. This has been a strange year. And here too, newspaper reporting on the oppressive heat down South. Wishing relief your way. It is dangerous for me to buy any new plants unless I have the ground ready. I need to divide daylilies just now . . . if only I could find the energy. I love your photos Gail especially the Cherry Brandy wearing a Fritillary. Gorgeous! casino all the time can create a comfort level for the user. offer a prize of a car.